A two and half hour trekking programme that starts from the Famous Periyar Lake which covers the moist deciduous forest and grass lands accompanied by a tribal guide .The timing of this trek is 7am, 7.30am, 10am, 10.30am, 2pm, and 2.30pm Maximum 6 persons and Minimum 4 person in which 4 slots going at a time. Whispering winds in the canopy of green leaves; birds calling all around in a mixed flock; butterflies floating away through the enchanting greenery. You may come across anything on the trail even a lone animal moving silently. Nature amazes you through many off its mysterious expression. Different nature trails traversing diverse habitats form the trekking routes, generally 4 to 5 km. in length. 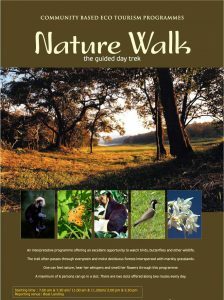 This is an interpretive programme offering excellent opportunity to watch birds, butterflies and other wildlife. The trails often pass through evergreen and moist deciduous forests interspersed with marshy grasslands. 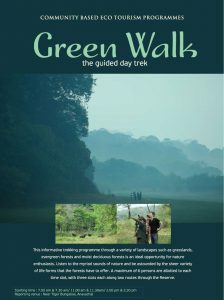 The Green Walk is the right programme to feel nature, hear her whispers and smell the fragrance of wild flowers. A three hour trekking programme that stats from the Tiger Bungalow that passes through the tribal community area which covers the grasslands, moist deciduous forest accompanied by a tribal guide. The timing of this trek is 7am, 7.30am, 11am, 11.30am, 2pm, and 2.30pm Maximum 6 persons and Minimum 4 persons in which 3 slots going at a time.